Hi everyone! I’m sure this is nothing new, but it is for us, and I just had to share! 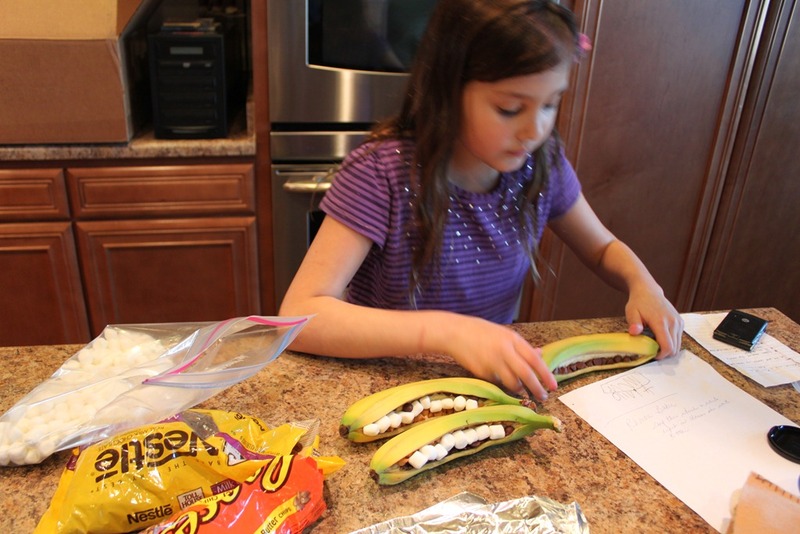 This week we made banana boats for the kiddos. No, we weren’t camping or anything like that, just looking for a little fun on a plain ole’ weekday! The good news is that these tasty treats are so easy to make, your kiddos can do the honors! Slice open banana along one side, but not all the way to the ends. Stuff chocolate chips, caramels, and marshmallows all over inside the peel. The more the better! 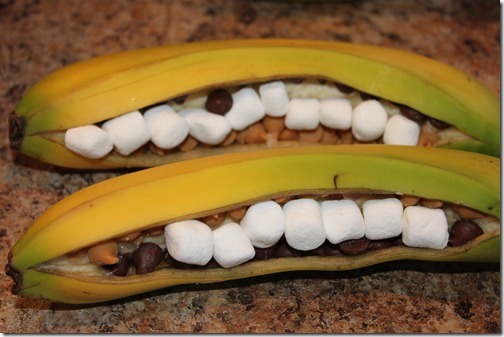 Wrap each stuffed banana in aluminum foil and grill for about 5-10 minutes or until bananas are nice and squishy. Alternate method: Bake at 350 degrees for about 15 minutes or until bananas are soft and ingredients are melted. Hope you enjoy this simple and tasty dessert, even if it is just a regular ole’ Wednesday! Have not thought of these in a dogs age! Never seen them done in their skins… Have been stressing over finding new desserts. Thanks! Looks like some yummy fun. Thanks! So cute! May have to try the today! We do these all the time when we go camping. We just use the campfire to cook them. I had never thought of doing them on the grill at home. 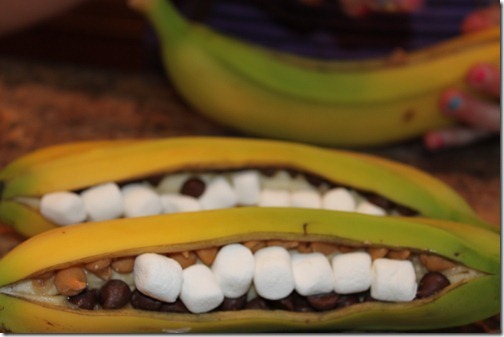 My kids will love the surprise of getting these when we aren’t camping. These are super delicious. My kids love it!! Sometimes as a treat we will do them for breakfast, adding strawberries and nutella with a waffle. 🙂 Have a great day! These sound like such a fun treat! I used to LOVE these as a kid! what a great idea! I have never heard of these, but this sounds like a wonderful Friday night treat to kick off the weekend! My husband is currently overseas, so new ideas for fun things to do to keep ourselves busy and not dwelling on what is missing in our house are greatly appreciated! Thanks!